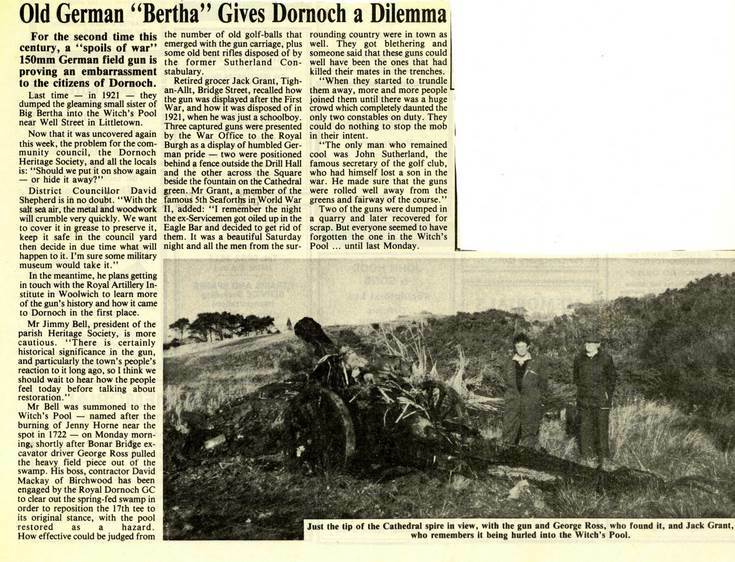 Copy of an newspaper cutting with title 'Old German 'Bertha' gives Dornoch a dilemma' with monochrome photograph of a 150mm German field gun which was dumped in 1921 in the the Witch' pool near Well Stree in Littletown, Dornoch. The article records that three little sister field guns of the infamous 'Great Bertha' howitzer were given to the Royal Burgh and put on display post World War 1. In 1921 after a night at the Eagle Hotel, some veterans felt the guns, which could have killed their comrades, should no longer be on display - hence the dumping. The dilemma facing the Community Council - should an excavated gun be put on show or hidden away? The contractor was Alistair Mackay, Proncycroy, Dornoch. Not his father David Mackay, Birchwood.